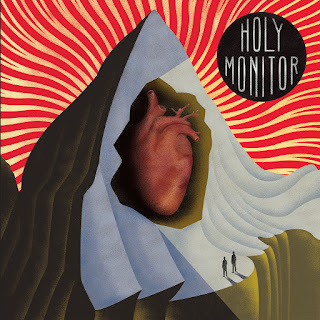 Almost two years after their s/t debut release (a few words here) Holy Monitor are back with their sophomore album satisfying and confirming with the best way our expectations which their debut deservedly generated. Blending several different influences but always under the wings of neo-psychedelia and kraut, the music of Holy Monitor has a soothing effect to my ears if not to my brain as well. "II" is a worthy successor of their tasty s/t debut and although there are no significant differences on their compositional approach they have retained their refreshing musical style while maybe giving more emphasis to the kraut, 'motorik' aspect of their music, keeping the keys in a leading role thus creating through them their favorite cosmic, space ambient feeling. It's always a pleasure to see new bands emerging and worthily filling gaps in the underground scene and currently, there is a great void in this genre in the Greek Underground and Holy Monitor may be the spark for new bands to follow this path. Holy Monitor was formed by Stefanos Mitsis (guitar) and George Nikas (guitar/vocals) in the summer of 2015 in Athens Greece, as a studio project. After recording and releasing “Golden Light” and “Aeolus” EP’s, the band was joined by Alex Bolpasis (bass), Vangelis Mitsis (keyboards) and Dimitris Doumouliakas (drums) and started performing live as a five piece. Their self-titled album was released in 2017 by Blackspin Records/Primitive Music. Blending motorik kraut rhythms, hypnotic vocals and sticky guitar riffs, the band creates an environment of cosmic-space feelings, leading the audience into a bright sonic swirl of psychedelic oscillations. Their sophomore album “II” is out on the 12th of October 2018.